One of five charming barn conversions set in extensive grounds in this delightful corner of rural Norfolk - only five miles from the traditional seaside town of Cromer. Sleeps 2. 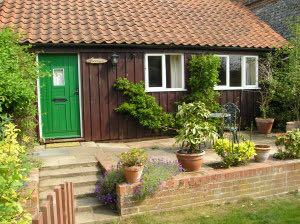 Thorpegate Cottage is a one-bedroom barn conversion which sleeps two, adjoining Pinewood Cottage. Recently renovated and decorated to a high standard, it provides modern co-ordinated accommodation within a traditional setting. All rooms have beamed and vaulted ceilings and the living area has wood flooring with rugs. The shower room is � tiled, with a modern suite, ceramic tiled floor, electric power shower and shaver point. The open-plan living and dining area is inviting and relaxing while the kitchen recess is well-equipped with a range or modern wall and floor units. The spacious, colour co-ordinated bedroom has a double bed, wardrobe and drawers. "Enjoyed our second stay in Thorpegate. It has everything you need and more - even delicious fresh cake! Thank you for that, and all else. We'll be back." "Cosy cottage. Information pack very useful. Vernon & Suffield Arms very good." "Another enjoyable Norfolk holiday. 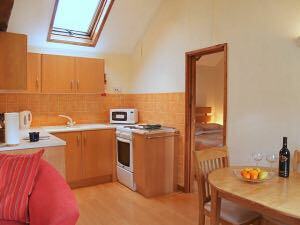 Thanks for the use of your lovely cosy cottage."